This is the MiniArt 35169 kit in 1/35 scale, of the ‘German Pz.Kpfw.III Ausf. D’. Panzer III was the common name of a medium tank that was developed in the 1930s by Germany and was used extensively in World War II. 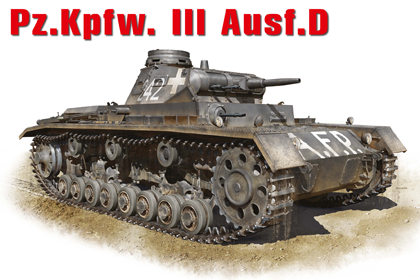 The official German designation was Panzerkampfwagen III Sd.Kfz.141 (abbreviated Pz.Kpfw.III) translating as “armoured fighting vehicle”. It was intended to fight other armoured fighting vehicles and serve alongside the infantry support Panzer IV. From 1942, the last version of Panzer III mounted the 7.5 cm KwK 37 L/24, better suited for infantry support. Production of the Panzer III ended in 1943. However, the Panzer III’s capable chassis provided hulls for the Sturmgeschütz III assault gun until the end of the war. This entry was posted in Kits, Stash and tagged 1/35, 35169, german, miniart, pz.kpfw.iii, sd.kfz.141 by Thomas. Bookmark the permalink.